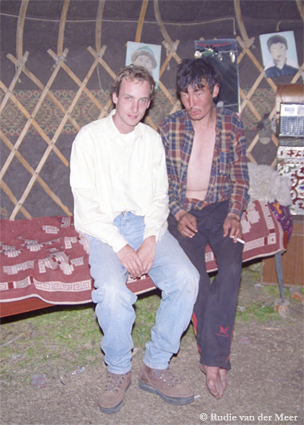 Rudie as a student on an expedition in the Altai Mountains, South Siberia. Inside a kibitka visiting Mongolian nomads. Welcome to my photography site. My passion for photography started when I was at university and was travelling abroad for my study. During these travels I developed a special interest for panorama photography. Panorama photography at that time with analogue film was not that common and advanced as it is with digital camera's nowadays. Part of the images on this site have been scanned from negatives and stitched together with panorama software. The most recent photos where created by me using a combination of Nikon D700 and Nikkor lenses. This site offers a full spectrum of digital panorama photography. This includes images of landscape photography, Gigapan panorama zoom and 360 VR. One of my favorite panorama's are my photos of aurora borealis. In the winter of 2005/2006 I saw the northern lights for the first time in my life. I was fascinated by seeing this natural phenomenon at the sky and was determined to photograph it. Photographing the northern lights is challenging as the light conditions are poor during the night, and special equipment is required. A combination of full frame DSLR camera's with high sensitivity sensors and fast wide-angle lenses enabled me to capture the beautiful colors of the northern lights. As the northern lights are not static but move across the sky with varying color displays they never look the same. This makes photographing the northern lights every time again as spectacular as the first time that I saw these beautiful lights at the sky. I do hope that you enjoy the images on my site!